Production of jumbo squid in Chile has fluctuated since the directed fishery began in the late 1990s, peaking at 250,000 t/yr in 2005, but only 110,000 t in 2013. In Peru, however, the fishery has increased throughout the 2000s, with the artisanal fishery growing while the industrial fishery declined. 250,000 t were captured in 2013. The Chinese fishery on the high seas has risen steadily since beginning in 2001, catching 325,000 t in 2015. Data on US imports for Humboldt/jumbo squid specifically are not available; however, imports of “squid not specifically provided for” are overwhelmingly of Chinese origin. Squid caught in Chile, China and Peru by jig are Recommended due to low gear impacts on bycatch and the ecosystem. Jigging catches no other species, and have minimal impacts on the seafloor. There is limited information on stock status and fishing mortality, due to a lack of co-ordinated assessment effort between the major fisheries so, while there are some indicators of a healthy stock, abundance and mortality criteria are scored a moderate concern. Management is considered moderately effective, however the Chinese fishery on the high seas is rated ineffective for enforcement and stakeholder inclusion. The Mexican Humboldt squid was fished at a very low level between the 1960’s and 1990’s. It was reactivated in 1995 after a period of inactivity due to a population collapse. This collapse is thought to have been due to environmental conditions and fishing pressure. The fishery increased to a peak in 2004 and has been fluctuating at 650,000 to 950,000 metric tonnes a year. Mexico landed 2.4% of the Humboldt squid caught globally in 2012. US imports of Humboldt squid have increased rapidly in the past few years. The squid is sold as calamari steak, abalone-style calamari, or imitation abalone. The fishery is managed by the National Commission of Aquaculture and Fishing (CONAPESCA). Of concern is the illegal fishing that occurs despite improvements in the fishery’s management scheme. Regulations such as weekly monitoring of the catch and fishing permits exist. More scientific research is expected in the near future due to the species’ expanding range and importance as both a predator and prey item in the ecosystem. Humboldt squids have life history characteristics that make them resilient against fishing pressure. These include a short lifespan and high fecundity. Population abundance is heavily influenced by environmental variation such as El Nino events. Although stock status can fluctuate greatly, this also allows the population to recover quickly. Demand for Humboldt squid is currently low, which puts the species at low risk for overfishing. Scientific models and landing data suggest that stock status is healthy. Jigs do not make contact with the ocean floor and thus do not cause negative impacts to the habitat. There is evidence that the Humboldt squid is a species of exceptional importance. Research is needed on its role in the ecosystem. Jigging is a highly selective fishing method which does not cause bycatch. Japanese squid are caught by several methods: jig, unassociated purse seine, bottom trawl and trap net. This species accounted for 77% of Japan’s national total squid catch in 2015. Of these fishing methods, jig and unassociated purse seine caught squid are recommended by Ocean Wise. The Japanese Fisheries Research and Education Agency (FRA) is responsible for managing the fishery. FRA regularly assesses the squid population which is healthy and not overfished. Jigging and unassociated purse seines cause very little bycatch as they are selective fishing methods. However, bottom trawls and trap nets can cause high amounts of bycatch. Data on these non-target species is not collected, and management has not implemented regulations to attempt to reduce bycatch levels. This is a critical concern, especially for the bottom trawl fishery. Jigs and purse seines do not impact the habitat. Trap nets are usually set in coastal waters and can significantly damage kelp forests. While bottom trawls are prohibited from operating in areas where kelp forests are abundant, they can nevertheless cause habitat damage in areas where they operate. In 2013, catches of Japanese flying squid in both Japan and the Republic of Korea totaled 330,136mt with about 85% of this catch originating from Japan. Japan consumes most of its catch domestically. The California market squid fishery is the largest by landings in California, representing 66% of all capture fisheries by mass, and 41% by value. Landings have fluctuated widely over the past 30 years, but always increasing, with a peak in 2010 and 2011 of more than 130,000 mt. Value has also increased dramatically over the past decade and recently landings have contributed more to the ex-vessel value of all west coast landings than all finfish combined. In 2011, 130,000 mt of squid was exported worth $180 million, with almost 60% going to China. California market squid caught in California with purse seines has been upgraded to Ocean Wise Recommended, due to improvements in the scores for impacts on stock and impacts on other species. Although there are no estimates for stock abundance, the species is not highly vulnerable and a number of fishery independent data indicate that the stock is healthy and that overfishing is unlikely. Bycatch is very low, with no species caught in enough quantities to be considered for the assessment; however, there has not been an observer program in the fishery for over ten years. Management is considered moderately effective, though improvements could be made with stock assessments that include more robust reference points and adjustments to reduce fishing pressure in years of low abundance, as well as updates to the bycatch assessment. Impacts on the habitat are moderate, but the species has an important ecological role as both predator and prey and, although a network of MPAs may be effective in providing some protection, efforts to assess the fisheries impacts on the ecosystem are ongoing. There are more than 300 species of squid distributed worldwide. Squid landings have increased rapidly since the 1980’s, both because of consumer popularity and also due to the depletion of fish stocks. In 2011, almost 5000 tonnes of squid were imported into the US. Thailand and India are two of the three main countries that export squid to the US. There is no international organization that manages the squid. Countries must individually regulate the population within their exclusive economic zones. Since the squid live for only one year, it is difficult to assess the population status before the fishing season begins. Combined with lack of enforcement, management is challenging and ineffective. Population status is sensitive to changes in the environment. Despite their resilience, stock status is unknown and little scientific information is collected on the species. Prior to a ban in 1993, drift gillnets were the primary gear used to catch squid. Nowadays, otter trawls, sometimes with light luring techniques, are primarily used to catch squid. No data is collected on the bycatch associated with this fishing method. It is believed that the otter trawls negatively affect invertebrates, forage fish, sharks, marine mammals, finfish, turtles, sharks, and corals. Restrictions exist on the use of otter trawls, including minimum mesh sizes, and area closures, though knowledge is lacking on these regulations, and lack of enforcement is prevalent. Otter trawls are known to sometimes make contact with the seafloor, thus damaging habitat. It is not known what the impacts are of removing squid from the ecosystem, but since they act as both predator and prey in the ecosystem, their absence may have an unanticipated large effect. Historical landings of the longfin squid have been variable. Foreign vessels landed 37,000 mt in 1973. After the late 1980’s, the fishery was closed to foreign vessels. Domestic quotas were set in 2000, and landings decreased, with the fishery being closed several times. Longfin squid have life history characteristics such as their short life span that make them inherently resilient against fishing pressure. Stock assessments are regularly performed. While the stock is not thought to be overfished, there is some disagreement about the amount of fishing mortality that the population can sustain. The longfin squid fishery is generally well-managed, although improvements could be made regarding the use of scientific advice and the reduction of bycatch. Bottom trawls are highly damaging to the ecosystem. They are associated with physical damage to the habitat, resuspension of sediment, and injury and mortality to organisms amongst other negative effects. Although longfin squid play an important role in the ecosystem, their exact functions are not clear. Recent research has been making progress in this field. The bottom trawl longfin squid fishery causes the bycatch of the endangered loggerhead turtle which is a concern. Endangered populations are vulnerable to fishing mortality. Interest in the shortfin squid fishery began in the 1970’s and rapidly peaked to landings of 162,100 mt in 1979, before decreasing to only 400 mt in 1983. Landings have not increased since then, and have remained variable. Management has successfully implemented plans for the recovery of the shortfin squid population. 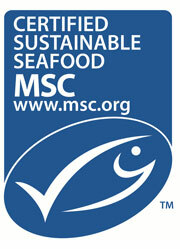 Additionally, bycatch is monitored, and regulations exist for the management of bycatch levels. Shortfin squid have life history characteristics such as their short life span that make them inherently resilient against fishing pressure. 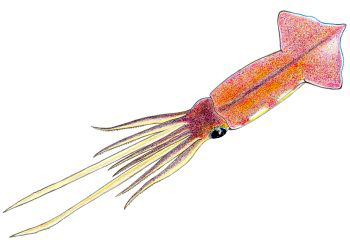 The stock status of shortfin squid is unknown due to a lack of data. Information on the structure of the population is nonexistent, and impacts of the fishery are unknown. Bottom trawls are highly damaging to the ecosystem. They are associated with physical damage to the habitat, resuspension of sediment, and injury and mortality to organisms amongst other negative effects. Although shortfin squid play an important role in the ecosystem, their exact functions are not clear. Recent research has been making progress in this field. The bottom trawl shortfin squid fishery causes the bycatch of the endangered loggerhead turtle which is a concern. Endangered populations are vulnerable to fishing mortality. There are more than 300 species of squid distributed worldwide. Squid landings have increased rapidly since the 1980’s, both because of consumer popularity and also due to the depletion of fish stocks. In 2011, almost 5000 tonnes of squid were imported into the US. Thailand and China are two of the three main countries that export squid to the US. There is no international organization that manages the squid. Countries must individually regulate the population within their exclusive economic zones. Since the squid live for only one year, it is difficult to assess the population status before the fishing season begins. Combined with lack of enforcement, management is challenging and ineffective. Mitre squid have life history characteristics that make them inherently resilient to fishing pressure, including a 1-year lifespan. Population status is sensitive to changes in the environment. Despite their resilience, stock status is unknown and little scientific information is collected on the species. The majority of Argentine shortfin squid is caught by jig. A minor component is captured as bycatch by the hake trawl fishery. Shortfin squid are found in the Southwest Atlantic from Brazil to southern Argentina, the Falkland islands and east to the high seas. Argentina accounts for one third of the total catch. Several seasonal spawning populations exist, resulting in reproduction through the entire year. It is difficult to estimate species abundance and there is evidence of overfishing in the species in recent years. In addition, the lack of cooperation between countries that fish the species, along with evidence of illegal fishing, poses challenges for the effective management of this transboundary species. Northeastern US. The entire fishing grounds for the stock that extends from the Gulf of Maine to Cape Hatteras, NC.